Looking for something pretty as well as healthy to serve your guests this holiday season? 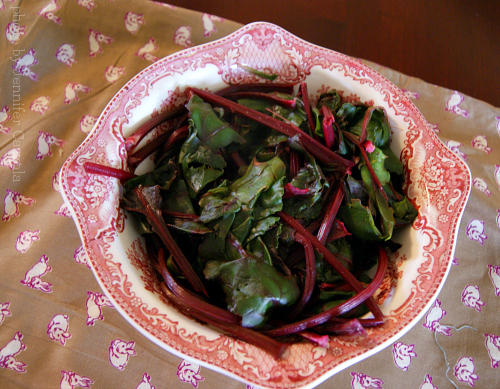 Here is an easy to prepare festive red and green beet salad. If you are not a fan of beets, perhaps it is because you haven't really tasted them fresh! My husband did not care for them at all — until we began growing our own. Now we plant them every year, and in my zone 6b garden we get to enjoy them twice: once in the spring, and then again in the fall. They are easy to grow, easy to store, and easy to prepare in the kitchen. Not to mention that both the roots and the greens are packed with vitamins and minerals. 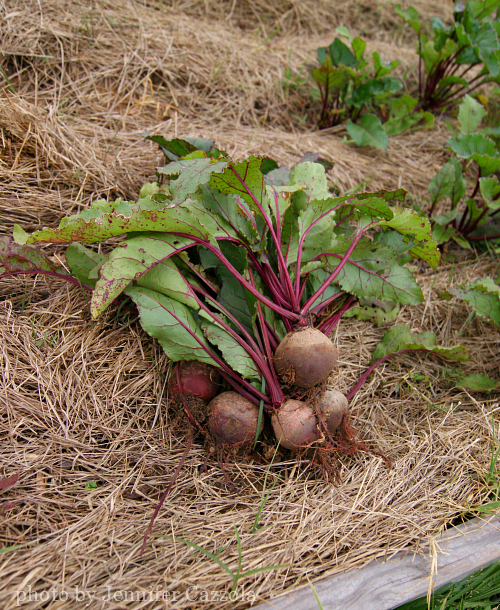 While it is probably too late to start a fall crop in your zone, make plans to include some beets in your garden plans next spring. There is a wide selection of heirloom seeds available in a variety of shapes, sizes, and unique colors. My favorite, and the one that we've had the most success with, in our garden is the Detroit Dark Red. Since both the tops and the roots can be eaten, beets perform double duty in the kitchen. If you have limited garden space, this is quite a perk. More bang for your buck! For this salad, the beets are cooked and tossed warm with about two tablespoons of balsamic vinegar. Before serving, the salad is drizzled with olive oil. This makes for a very light, fresh tasting salad. If you feel your guests or your family would like something a little more robust, substitute a generous shaking of your favorite homemade vinaigrette for the vinegar and eliminate the drizzled oil at the end. *To make the crispy walnuts: Combine walnuts with filtered water and a small amount of sea salt to taste. Set in a warm place for seven hours or overnight. Drain, then spread on a cookie sheet or dehydrator tray and dry at low heat (150 degrees Fahrenheit or less) for 12 to 14 hours. Nuts are done when they are dry and crisp. More info here. Wash the beets well and cook in a saucepan over medium heat for about 30 minutes or until easily pierced with a fork. Peel while running them under cold water, then cut into 1/2″ thick slices. Toss lightly with vinegar; about 2 tablespoons, more or less, to suit your taste. Salt, if desired. Arrange the salad greens on individual salad plates and top with the beets, allowing for about 4 to 5 slices per serving. Sprinkle with the goat cheese, the crispy walnuts, and the thyme. Drizzle generously with olive oil. Serve warm or at room temperature. May be made up to 4 hours in advance. This salad will serve about 4 people, but the amounts can easily be adjusted to suit your situation. For the recipe here, the salads have been assembled on individual serving plates. For a larger crowd, the salad could be assembled and served on a large platter. Your greens would be great for the compost bin or make a nice treat for your chickens, but they are very good for you too, containing the same amount nutrients as the root. While the greens themselves can be cultivated and harvested as a mini green, they are more nutritious prepared cooked. Beet greens, along with spinach and Swiss chard contain oxalic acid that blocks calcium and iron absorption. By cooking the greens and then discarding the cooking water you get the full benefit of the greens without the acid problem. Additionally, cooking will tame the bitter taste of the raw greens. We eat cooked beet greens often, many times accompanied by biscuits or cornbread which makes for a full and inexpensive meal. Wash well and trim out any bad spots. You may trim the stems if you wish, but I find them to be very pretty as well as tasty. In a large saucepan, heat about one inch of water to simmer, then add the greens and cover. Watch them! Don't wander off because they will cook fast. The end result should be a nice, vibrant green. Empty into a strainer and gently squeeze out any additional water. The greens will be hot, so you may want to use a potato masher for squeezing. To serve, toss with butter and sea salt to taste, or toss with chopped cooked bacon and a small amount of bacon grease. Other additions can include chopped boiled eggs or cooked navy beans. Please note that because greens cook down significantly, you will need more than you think to serve a family of four. A sink full of beet greens is sufficient amount for just my husband and me! Do you enjoy beets? What is your favorite way to prepare them? More beet info here: What To Do With Beets. 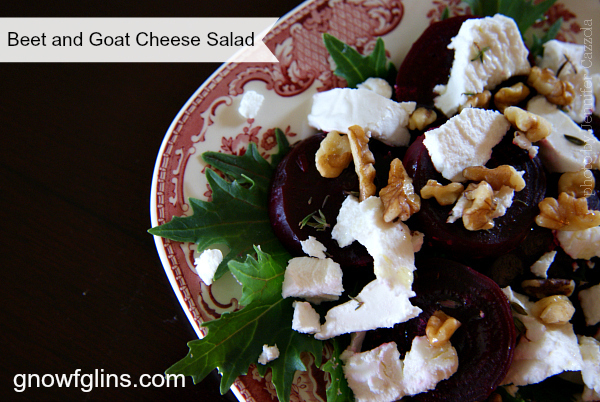 Beets, walnuts and goat cheese is one of my favorite combinations, but I never tried using the beet greens. Thanks for the great suggestion Jenny! I hope you give the greens a try and enjoy them! Jenny, this salad looks amazing! I only wish I had some beets and goat cheese right now! What a fantastic Thanksgiving side dish this would be.